You can control the heat of this soup by reducing (or eliminating) the cayenne and/or black pepper, and reducing the amount of fresh ginger. I just happen to like it very hot, and hate it when I’m served a dish where it appears the Chef is being apologetic for adding spices. 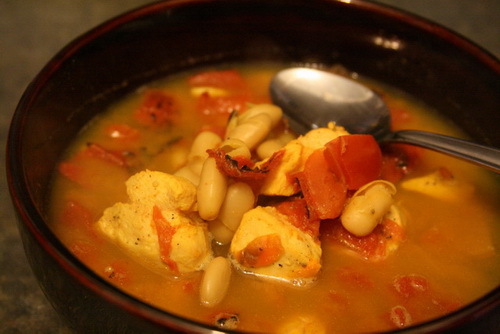 In a medium sized pot, place beans, chicken, tomatoes and spices. Stir to combine. Add enough fresh, cold water to cover the solids and slowly bring to a simmer. Vegetarian Option: Omit chicken and substitute cubed firm tofu, adding during the last 5 minutes or so, so the tofu does not disintegrate. This soup will freeze well for up to 3 months. NB: If making the vegetarian option, I’d suggest freezing without the inclusion of the tofu, and adding once you defrost and reheat.